Does this little cutie look familiar? 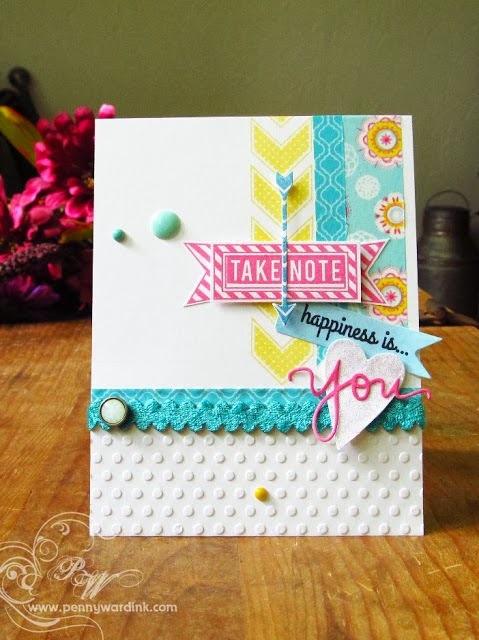 A few months ago this card and four others were chosen as winners at Moxie Fab World. Then.....MFW had them published in the April issue of Paper Crafts & Scrapbooking Magazine. My trendy card has some incredible artists surrounding it in the magazine...so honored to be published along side of: Lin Brandyberry, Tyra Babington, Donna Mikasa & Iwona Palamountain. Those are some awesome names to be linked with!!! I just want to give a big Puffy Heart Thanks to the wonderful friends at Moxie Fab World and PC&SM for selecting my artwork among the hundreds that entered the contest. Congratulations! I have been seeing a lot of your work published lately. Great job! Those other artists are honored to be in your company! This card certainly has gained recognition, and deservedly so! So much wonderful dimension and color on this, Penny! Very deserving of publication!! Beautiful card!! I love all the details and embellishments!! Truly very well done!! I became a follower of your blog through Bloglovin and Pinterest!! Hope you will take a minute and stop by my blog - I am at daisiesgirl.com! Come on by, I would love a visit!! Big congratulations Penny!! This is an incredible card and it's taken you places!!!! Happy dancing time. Hugs.